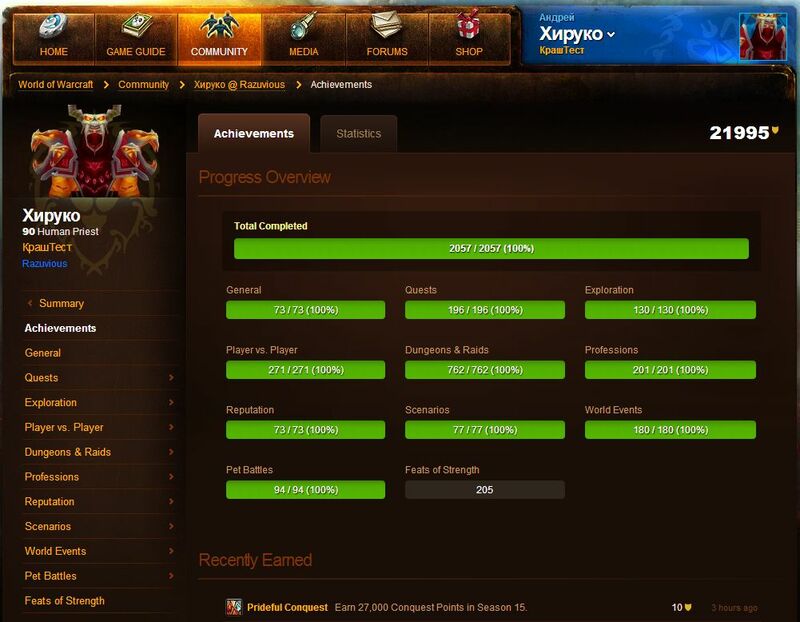 Russian World of WarCraft player, Хируко, has managed to unlock all of the game's 2057 achievements. By unlocking all those achievements, Хируко accrued 21,995 achievement points. He also completed 205 of the game's 300 feats of strength. Apparently, unlocking all those achievements required much more than spending all your waking hours in the game. In fact, Хируко devised a strategy where all of his guild members worked relentlessly to help him finish his achievements. Хируко and his guild chose a small PVP server to carry out their plan. About a quarter of the guild members tracked down and killed other top players to prevent them from beating Хируко to "Realm First" achievements. The rest of the members collected the items and materials he needed and handed them out to him so that he'd craft and level up his professions. Using 3 monitors and powerful NVIDIA Quadro SLI setup, Хируко played 12 different characters simultaneously. I would love to know how he was able to afford this. Since this happend in Russia, I am now worried the russians are up to something... again! Did he **** off to his toons after achieving the impossible? Take that Jizzard! I think that if you did all this, some kind of US experimental ION Cannon from space should take away your life as a reward. Retarded, pointless, sad, AND Russian? My my the pathetic train is fully loaded today. In Soviet Russia WoW plays you! Oh & additionally, in relation to this WoW achievement news, no ***** have yet been flown. they only give players something to do with their time in between raids or real content. Some nights you just want to chill in the game and chat, but as far as achievements...they need to be HARDER to get. EVERYONE gets an achievement for hitting every 10 levels. How is that special? It's NOT special if EVERY player has them.